Australia Day, 26 January, marked the 224th anniversary of the arrival of the first fleet of British colonies to disembark in the land down-under. Australia's Prime Minister, Julia Gillard and the Leader of the Opposition, Tony Abbott, and many others were at an award ceremony yesterday, in relative close proximity to the longstanding "Tent Embassy" of indigenous-rights supporters (which itself was celebrating an anniversary - it's 40th - on Thursday as well). Chaotic protest and some violence ensued as the two ideologies clashed - although it certainly could have been much worse. 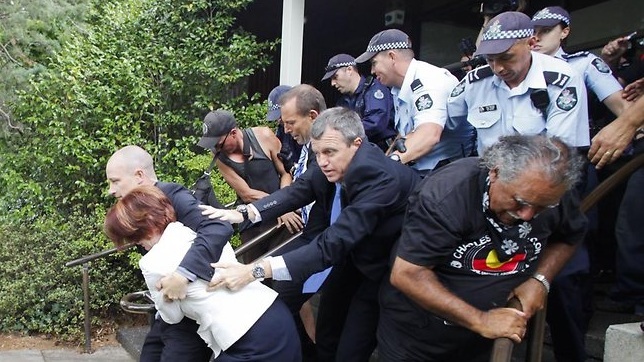 What follows is a brief analysis of some of Ms. Gillard's body language. At the 1:49 - 2:01 segment of this video, when Ms. Gillard's security expresses his concern to the PM, Julia shows us a high-anxiety/low confidence MAP (Manipulator, Adaptor or Pacifier - See another MAP example in Secret # 199: When a Lie is Told, Heard or Visualized ... by Vladimir's Eye) of interlaced fingers and arms held close to her lower chest. As the concern for increased violence crescendos, so do nonverbal indicators of anxiety. Gillard's classic nonverbal signal of the wringing her right hand with her left, exemplifies this nicely (from 2:13 - 2:19). Earlier today, when the Prime Minister was asked about the incident, she showed two brief expressions of genuine empathy for those deserving of the planned awards, as the ceremony was disrupted and those to be honored were not fully recognized. Ms. Gillard's central forehead contracted briefly - indicating emotional-pain-empathy, with a microexpression at the 3:15 mark (very evanescent) and a macroexpression of the same from 3:17 - 3:19. It is rare to see Heads-of-State in a potentially violent situation. Yet this reminds us how emotions are constantly displayed and readily available for others to use or abuse. The vast majority of people are completely unaware of just how much information they transmit. Their face and body are open books - constantly on exhibit for others to read.